Viewed by Larry Gleeson as part of the 2018 AFI DOCS Film Festival in Washington, D.C. 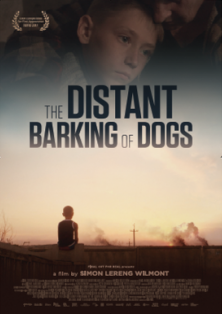 The Distant Barking of Dogs, a documentary written, directed and shot by Simon Lereng Wilmont, and produced by Monica Hellstrom, shows a slice of life in an Eastern Ukraine village located within a mile of the front line of the Russian/Ukraine armed conflict in the winter of 2016. The film highlights a year in the life of a ten-year-old boy, Oleg, with a fly-on-the-wall approach, as Oleg becomes desensitized to the fragments of war and, along the way, loses the innocence of childhood. The Distant Barking of Dogs has garnered awards from the 2017 Amsterdam International Documentary Film Festival (First Appearance Award), the DocAviv Film Festival (Best International Film) and the San Francisco International Film Festival (Golden Gate Award). The film’s protagonist, Oleg, a young, pre-teen boy, being raised by his grandmother (babushka), Alexandra, in their family home. While others are choosing to leave the area as there is no end in sight for the war, Alexandra has no intention of leaving the area quoting Ukrainian wisdom, “Every dog is a lion in its own home.” As the war draws on, each begins to rely on the other as a source of strength and inspiration. Female uniformed soldiers address Oleg’s elementary school class regarding the immediate dangers of the war. The children are animatedly engaged in their everyday lives discussing the collateral damage they encounter in the form of found weapons, undetonated mines and the loss of their fathers as they go off to join the army. From here the film follows Oleg and his activities, mainly outside of school. Oleg goes swimming in the summer as ordnance shells are exploding in the distance. Soon they are growing closer and Oleg and his older friend, Kostya, decide to run home fearing for their own safety. Later, Kostya will put a pistol into Oleg’s hand while encouraging the boy to shoot a helpless frog. One thing is consistent throughout the film is the sound of war in the not-so-far distance. Admittedly, Wilmont’s film lacks high drama, the uber intensity of combat, and the unfathomable devastation of bombed out towns and villages. Nevertheless, the underlying tension witnessing Oleg’s life unfolding under imminent danger of errant ordinance shells finding Oleg, his friends and Alexandra keeps an edge to the film. But the real question lies ahead. How will this war zone life experience affect Oleg and the children exposed to the constant danger of being killed as they grow into adulthood? I have seen parts of this movie, and it was something really devastating yet inspiring to watch. There is many people that face this trauma everyday and it is devastating to hear about, especially in this movie. Your review was spot on and very intriguing to read. When talked about how war will have an affect by stating,” the children exposed to the constant danger being killed as they grow into adulthood?” I couldn’t agree more with this statement. Its true, yet heartbreaking to say. I haven’t seen this film yet but it sounds like a good one. I’m intrigued by the title and am curious what the deeper meaning behind it is. I like how you covered the general plot and gave your opinion on the film but didn’t give anything away. I also like how you included the Ukrainian wisdom quote because it had me even more intrigued to see the film. I have not seen this movie yet but from the review it makes me want to see it. I am intrigued about the women soldier and the meaning behind the danger of the war. I like how you wrote about the movie but did not show us the whole story so we can still be intrigued to watch the movie. A friend of mine has seen this film and said that he loved it. After reading your review I feel like it will have a massive impact on me. I like your statements about the use of camera placement when you said that it was more like a “fly-on-the wall approach.” To me, this kind of camera usage always has more effect on the audience because we not only witness the transformations of the characters, but we witness it from a more “I saw it myself because I was there” way. Other films like to makes us feel as if we are there along side the characters but in movies/documentaries like these, i prefer to witness it as someone who had not experienced it with them, but somehow feel like I had witnessed them from afar. It also sounds like the Mise-en-scene works perfectly with the narrative. I truly look forward to watching the movie and developing my own analysis. Fantastic review Larry, I found it pretty interesting that your first paragraph was a description about the film and not just filling us in about the history behind “The Distant Barking or Dogs”, but both a brief summary of the film’s plot, and what kind of awards it was able to win. I like how you took the time to make this review about the narrative, the protagonist, and the theme. Coupled with the fact that you have given us so much to work with due to all of the details makes the process of imagining the scenes playing in my mind all the more easier.